Grade 7: Using the Sadlier We Live Our Faith series, students will spend the year discovering more about who Jesus really is and how we are called to live as the Body of Christ. Topics will include the message and purpose of Jesus’ calling, how the Sacraments make Christ alive for us today, and how we are called to live the Church’s mission given by Christ. Grade 8: Using the Sadlier We Live Our Faith series, students will discuss what it means to be Catholic and how we can nourish that faith through our choices and relations with others. They will look to our ancestors in faith and our Christian heritage for clues on how the Church’s heritage can give us hope today. Grade 9: These students will be using St. Mary's Press Catholic Faith Handbook to explore the foundational beliefs and practices of the Catholic Church. They'll study the big picture behind the Scriptures, how God reveals Himself through the person Jesus, the formation of the Church, the Sacraments and more. 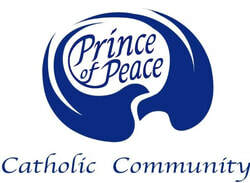 Grade 10: Our 10th grade students will be using a combination of resources - Dynamic Catholic's Decision Point & Ascension Press' Theology of the Body series - to bring them into better understanding of why our choices matter and why our faith is one of the most important choices we ever make. They will have real and relevant conversations about where they see God in their life and how they can make him the center of their life. In the 2nd half of the year, students will begin talking about Confirmation and gearing up for that preparation to kick off in the fall. Grade 11: Confirmation students will be preparing to receive the Sacrament of Confirmation, using Ascension Press’ Chosen series. Accompanying that curriculum will be an assortment of resources from Dynamic Catholic’s Decision Point, The Catholic Faith Handbook from St. Mary Press, and Ascension Press’ Alteration series. The Chosen series catechizes and challenges teens to fully embrace a life in Christ. The students will be equipped to receive the Sacrament of Confirmation, be called to a personal encounter with Jesus Christ, come to see what sets the Catholic Church apart, be inspired to an appreciation of the Sacraments, and learn from the examples of the saints. Other components of the Confirmation program include service, participation in Liturgy, and a day retreat to further prepare them for life as a disciple of Jesus Christ.